Characteristics of Traditional Chinese Medicine Use in Patients with Rheumatoid Arthritis in Taiwan: A Nationwide Population-Based Study. Huang MC1, Pai FT2, Lin CC3, Chang CM4, Chang HH5, Lee YC6, Sun MF7, Yen HR8. 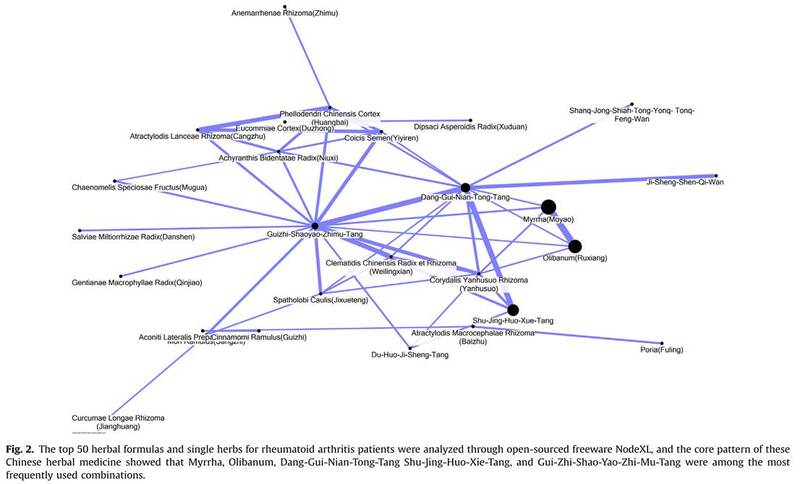 Large-scale study of traditional Chinese medicine (TCM) usage among patients with rheumatoidarthritis (RA) is lacking. The aim of this study is to evaluate the TCM usage among RA patients in Taiwan. We examined the "registry for catastrophic illness patient dataset" of the National Health Insurance Research Database (NHIRD; n=23 million people) in Taiwan. Patients (n=25,263) newly diagnosed as RA in 2001-2009 were included and then followed-up until the end of 2011. Based on the medical utilization, they were further categorized into TCM users (n=6,891; 27.3%) and non-TCM users (n=18,372; 72.7%). 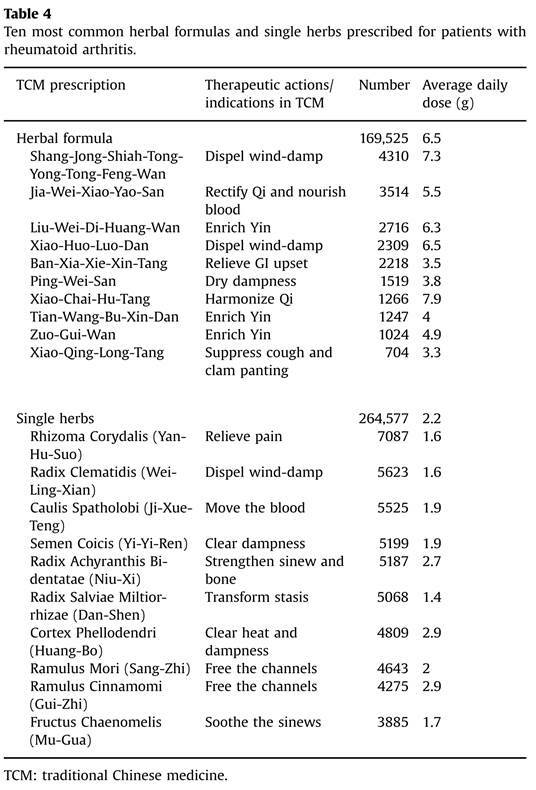 The demographic data and core prescription patterns of the TCM users were analyzed. Compared to non-TCM user, TCM users were younger (mean age: 49.6 versus 54.0 years), had a higher female/male ratio (82.7%/17.3% versus 74.1%/25.9%), resided in more urbanized area. Herbal remedies were the most commonly used therapeutic approach (76.4%), followed by combining acupuncture (21.1%). The frequency of outpatient visits in TCM users was higher across all disease categories except circulatory system. The most commonly prescribed formula and herb was Shang-Jong-Shiah-Tong-Yong-Tong-Feng-Wan and Rhizoma Corydalis, respectively. The analysis of core pattern revealed that Dang-Gui-Nian-Tong-Tang, Shu-Jing-Huo-Xie-Tang, Gui-Zhi-Shao-Yao-Zhi-Mu-Tang, Myrrha and Olibanum, were among the most frequently used combinations. RA patients who had anxiety and depression, allergic rhinitis, osteoporosis, menstrual disorder, and menopausal syndrome were prone to have more TCM visits compared to non-TCM users. 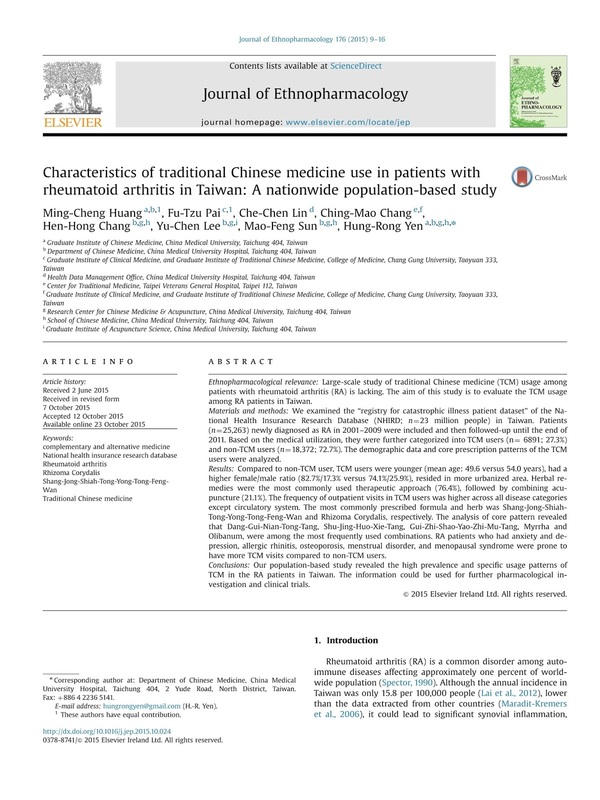 Our population-based study revealed the high prevalence and specific usage patterns of TCM in the RA patients in Taiwan. The information could be used for further pharmacological investigation and clinical trials.